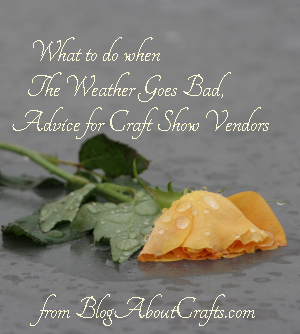 Home » Craft Show Displays » When to leave a craft fair in bad weather? You’ve set up your booth have your items displayed nicely and then the weather turns bad, really bad. I’m hearing more and more festivals and fairs are requiring exhibitors to remain for the entire duration of the event. In good weather, I think it’s a good idea. There’s nothing worse than traveling to an event, even paying admission, to only find many of the vendors are packing up or have already left. One vendor recently told me the event we were visiting had a $400 fine for leaving early. They had required a deposit in that amount and simply wouldn’t refund the deposit if she left early. That sort of thing puts a whole new wrinkle on the stay or not to stay debate when the weather gets nasty. That particular day, the issue wasn’t weather, but foot traffic. The event was pretty much a bomb – many of the vendors didn’t even earn their space back in raw sales. They cringed at the thought of their losses when they deducted their item costs from their sales. We met another vendor at a stormy event. She was trying to evaluate which would be more expensive for her, more product losses from breakage or losing her deposit for leaving early. She was almost in tears. Neither option was good. In one case, we watched foul weather bend a vendor’s tent pole. Can’t imagine how that little bit of destruction cost her. I was asked by a talented photographer, Robin, on my earlier post on craft shows in windy conditions, when is it time to bail when conditions get too bad. Robin’s work is susceptible to both wind (glass breakage and damaged frames) and rain (destruction of her art as well as the finish on the frames). There’s an irony to bad weather. I’ve noticed that while the attendees are more sparse, they are more inclined to buy. Whether in sympathy for the vendors or because they really are interested in finding some unique wonderful thing that day, the attendees do seem to be buyers rather than lookers. In the end, each vendor is going to have to make their own decision about staying or leaving. If you have mixture of pieces that have varying degrees of weather tolerance, maybe remove the most fragile items from your display. Perhaps, just leave those items that won’t blow away or can tolerate getting wet on display. One, you might get a die-hard customer. And two, I doubt there’s any show contract that stipulates you must stay for the entire event and you must maintain a full booth the entire time. If the weather is costing you money, it may be wiser to take the loss of your deposit. If you can protect your wares, displays and even your tent, it may be better to stay. Event organizers may be kind enough to drop the leave early policy. Unfortunately, that doesn’t always happen until days after the event is over and they receive enough complaints. We were at one event where the organizers went around telling each vendor they could leave early without fear of losing their deposit – kudos to them. I guess if I were evaluating whether to leave or not, I would consider if the losses will equal or surpass any loss of deposit or penalties for leaving early as well as any sales I might have made (assuming there are any attendees sticking it out). Yep, that does require a bit of a crystal ball gazing and taking your best guess. If you believe you’ll lose more by staying, it just makes more sense to me to leave. After all, a reputable event organizer will hopefully return your deposit – particularly if the weather is easily recognized as dangerous (thunderstorms) or severe enough to drive away attendees. If the weather is foul, attendees do seem generally more willing to view items under tarps, in tubs or without the benefit of being shown in a nice display. I saw attendees actually crawl under tarps placed over tables to view items at one event. Perhaps give that a try before packing up and leaving – assuming it is a viable option. In the end, there’s no magic formula to determining when a vender should leave a craft fair in bad weather. One has to be at the event to determine if any buyers are left and if conditions just don’t make staying financially feasible. I’d love to hear your event war stories, ideas for protecting your wares in bad weather or any suggestions you could add. Thank you to Matthias Pahl for making his wonderful photograph available on Stock.xchng. Open the conversation by being the first to comment on When to leave a craft fair in bad weather?.